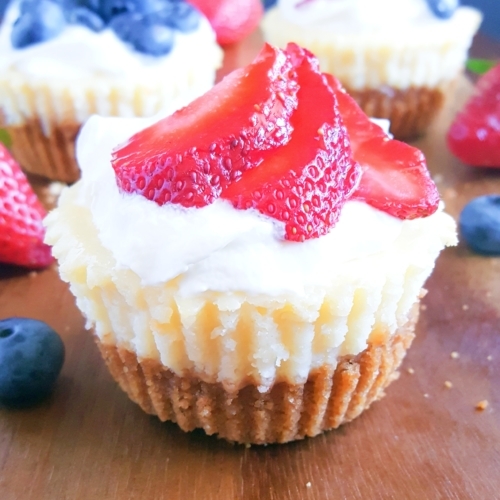 This recipe for classic mini cheesecakes is super easy to make. 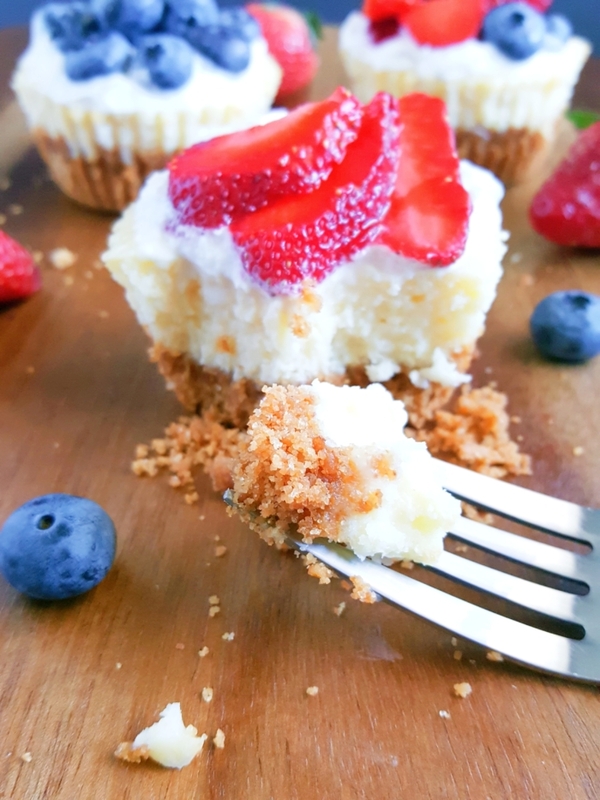 Luscious cream cheese filling poured on to a graham cracker crust and baked to perfection in a muffin pan. Top them with whipped cream, fruit, salted caramel or your favorite pie filling! If you love cheesecake, I mean really love cheesecake, you are in for a treat. A perfectly-sized, gonna-wanna-have-seconds, ridiculously-easy-to-make treat. I love cheesecake but they can be so intimidating to make. Have you ever tried making a whole cheesecake? I have, a few times. You have to be meticulous and do everything just right and sometimes you don’t even end up with the result you were looking for. You have to pre-bake the crust and you have to bake it in a water bath and all of that stuff. It’s exhausting and it’s time consuming. Never again will I attempt to make a whole cheesecake with all of those crazy steps. I mean, why would I? 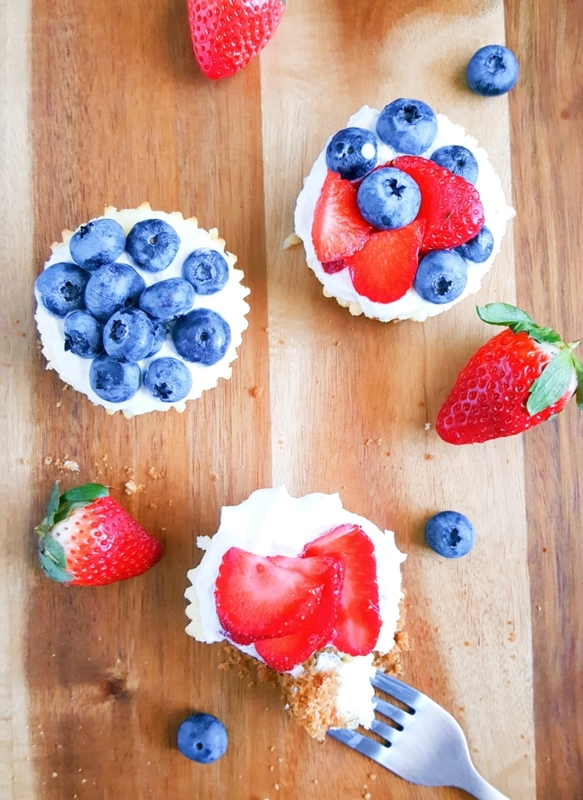 I can just make these mini cheesecakes instead. They’re so much easier to make, they take less time to bake, and they’re already pre-portioned. And also, I can put a different topping on each individual cheesecake if I want to. You gotta have options. No need to break out the sour cream because you don’t need it for this recipe either. This is as simple as it gets. I guarantee you that this will be one of the easiest, if not the easiest cheesecake recipes you will ever make and will make again and again. This recipe is a keeper. Bring your cream cheese up to room temperature. Your cream cheese must be completely at room temperature all the way through before beginning. Cold cream cheese is much more difficult to mix. If you are short on time or just simply didn’t remember to take it out of the fridge, you can pop it in the microwave for 20 second intervals (mixing in between every interval) until it’s fully softened. Do not microwave to the point of melting. Stir your cream cheese first. Stirring the cream cheese first before adding any other ingredients ensures that there are no lumps in the batter. A lumpy batter can result in an unpleasant texture and “hard spots” of cream cheese in the end product. Bring the eggs up to room temperature. Bringing the eggs to room temperature helps to avoid the cream cheese reverting back to its previous temperature and becoming hard again. Slightly under bake the cheesecakes. Slightly under baking the cheesecakes will yield a creamier texture. You want your cheesecakes to have a jiggly center. Do not bake them all the way through because this is when cracks will appear. Cracks in your cheesecakes means that they’re over baked. If they start to crack take them out of the oven right away. Also, do not bake them till they are brown around the edges. This will prevent your cheesecakes from getting soggy. Just so we’re clear, these are not cheesecake bites. 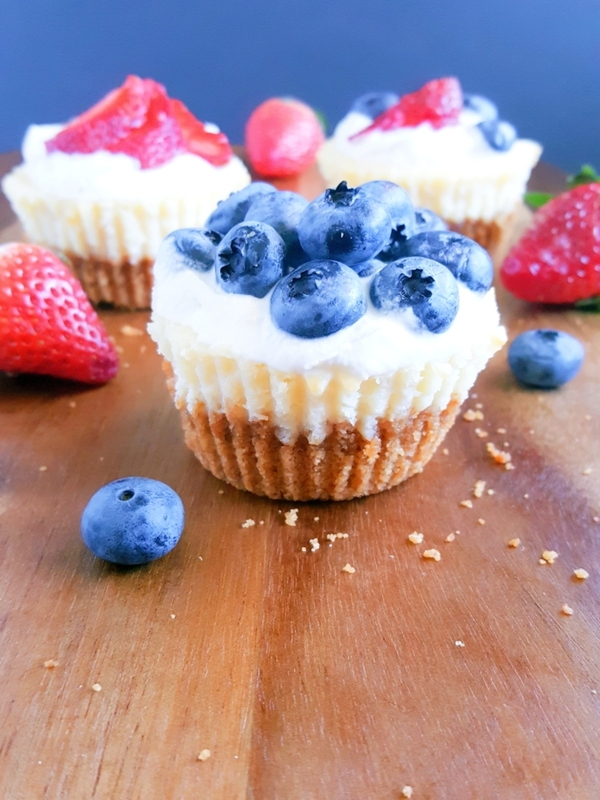 These mini cheesecakes are made in a standard-size muffin pan. Cheesecake bites are made in a mini muffin pan. I just had to get that out the way because I know sometimes people confuse the two. This batter is really runny. I made a huge mess trying to use my spoon to pour the batter into the muffin cups and I was using a really large bowl so pouring it out directly didn’t work either. I recommend using a large cookie scoop to get the batter into the muffin cups but if you don’t have one you can make do with a ¼ cup measure. The cheesecakes will be puffy when they come out of the oven. This is completely normal. They don’t stay like that though. They’ll sink as they cool. 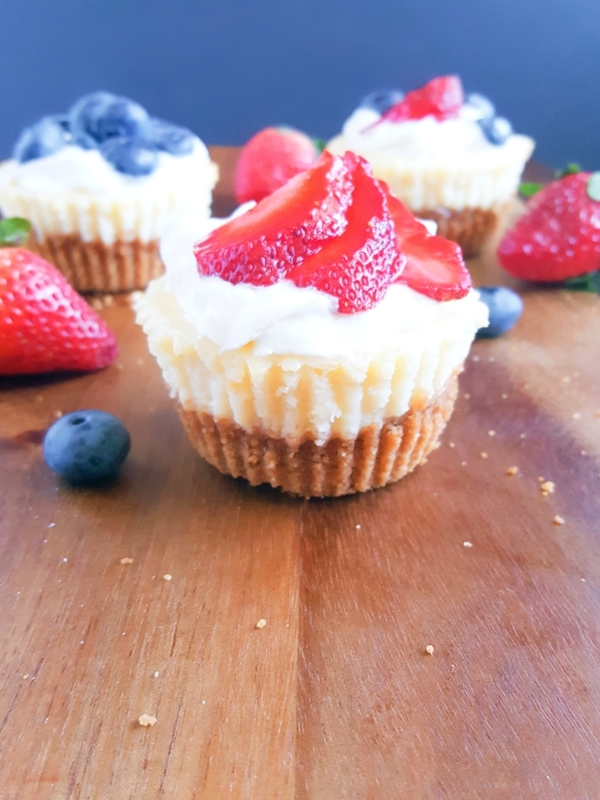 These mini cheesecakes are not overly sweet and the portion size is just enough to satisfy that (hard to ignore) cream cheese craving, although, you might find yourself having more than just one. They’re irresistible. You can top them with absolutely anything you want or you can just eat them plain. They’re great either way. I topped mine with sweetened whipped cream and fresh fruit and they were a hit. Everyone loved them. But don’t stop there. You can top these with whatever you like and not even just toppings; you can incorporate different ingredients into the batter itself. This recipe is completely adaptable so get creative and customize them however you like. This recipe is easily doubled. So, if you’re having a party just set a variety of different toppings out on the table and all of your guests can have fun making their own little cheesecake creations. It’s a good idea right?! Now I wanna throw a party just so I can do that. 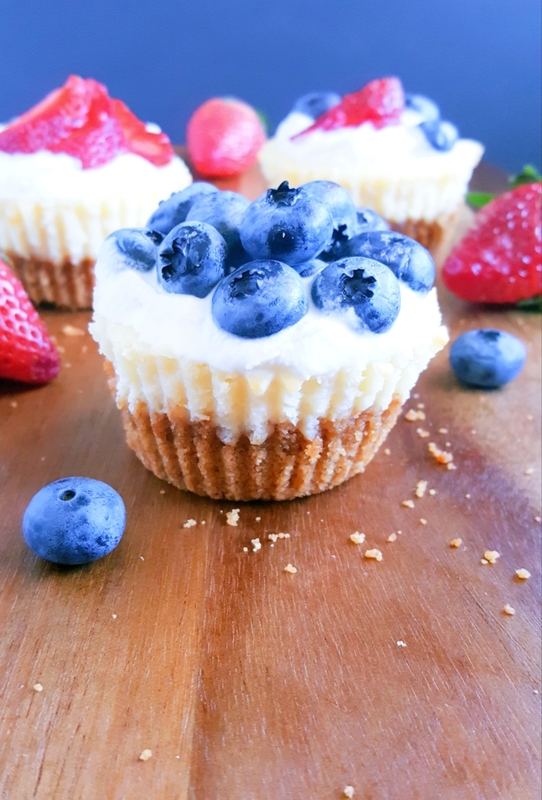 Even if you just wanna pig out and treat yourself to some cheesecake or if you’re planning something romantic and you only need a few, you can still do that because this recipe is also easily halved. The only hard thing about this recipe is waiting. You have to let the cheesecakes cool completely and then chill in the fridge for two hours. Here’s what I do—I bake the cheesecakes the night before and leave them in the fridge overnight so that the next day all I have to do is top them and serve. I find that they taste better that way too. I kept my cheesecakes in the fridge for up to a week and they still tasted great. Then, I froze them and they froze quite well. They should last in the freezer for about six months but come on… who in their right cheesecake-loving mind is going to let these sit in there for that long? These cheesecakes are surprisingly quick to defrost. The best way to defrost them is to take them straight from the freezer and let them sit out at room temperature for half an hour. I thought that condensation would have formed on the tops making them soggy but no, they were just fine. Still tasted as great as ever. So unlike a whole cheesecake you don’t have to let them sit in the fridge overnight. An even quicker way to defrost them is to place them in the microwave, one at a time, for 10 seconds. That’s it! Yes, I know it’s a really short amount of time but remember, you want them to still be cold, not warm. I defrosted one using the ‘Defrost’ setting just to see how it would turn out and it was horrible! It got all rubbery and the texture was basically ruined so I don’t recommend using that setting. 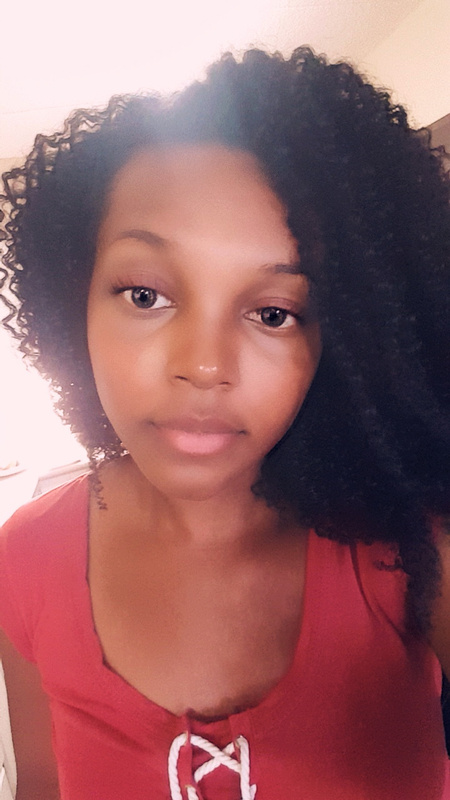 But can you believe that? A whole mini cheesecake just gone to waste. I could’ve eaten that. 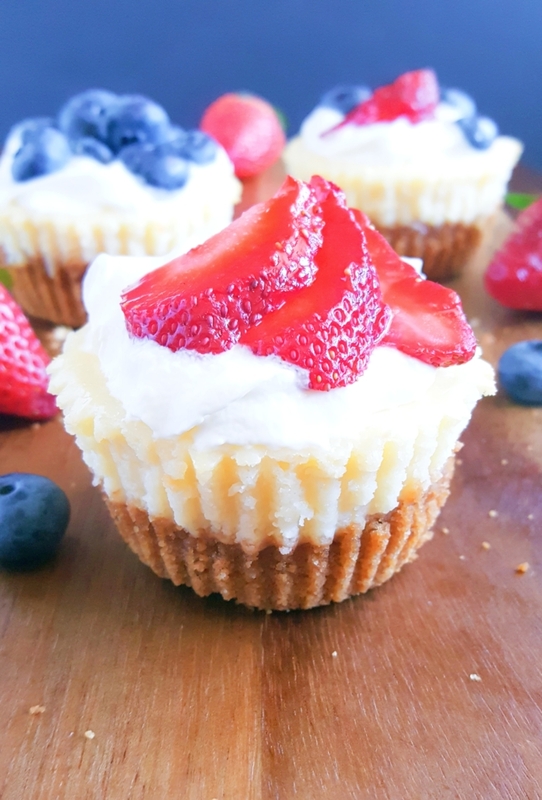 These mini cheesecakes are smooth, creamy, and perfectly sweetened. Don’t settle for no-bake cheesecakes when you’ve got this insanely easy recipe right at your fingertips. You can even mix and match. The possibilities are endless. So what are you going to top your cheesecakes with? Let me know in the comments below! Preheat oven to 350°F. Line muffin pan with muffin liners. Set aside. In a medium-sized bowl combine butter, sugar and graham cracker crumbs. Press 1 heaping tablespoon of crumb mixture into each muffin cup. In a large bowl beat cream cheese until smooth. Add sugar and mix well. Add eggs, vanilla extract and mix until blended (batter will be runny). Pour mixture over the crusts filling the muffin cups all the way to the top. Bake for 18 - 20 minutes. DO NOT over bake. Cool completely. Refrigerate for at least 2 hours. Serve chilled with your favorite topping.